Valeč – Castle and Holy Trinity Church. 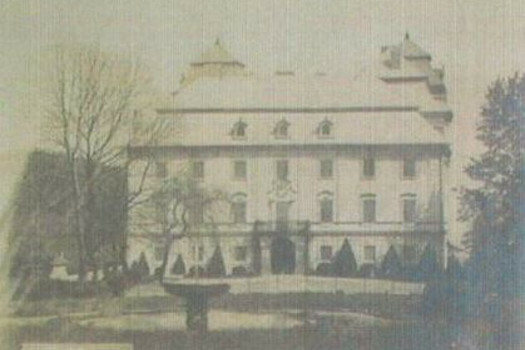 The antecedent to the current building was a fortified house rebuilt as a Renaissance country house by the Štampach family at the end of the 16th century. 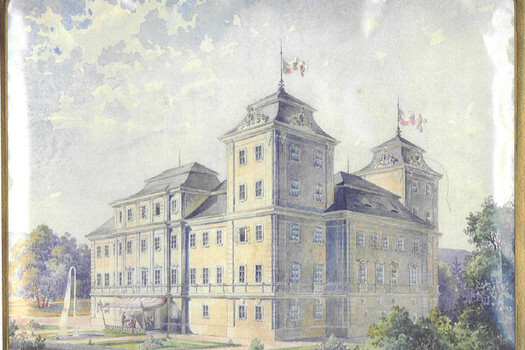 The Baroque complex developed in a radical recon-struction and expansion from 1694–1718 by Johann Christoph Freiherr von Steinbach. The building work was directed by Francesco Barelli and foreman bricklayer G. Beana Pessina, and from 1701 by Giovanni Antonio Biana Rossa; the architecture of it is similar to work by Giovanni Battiste Alliprandi. 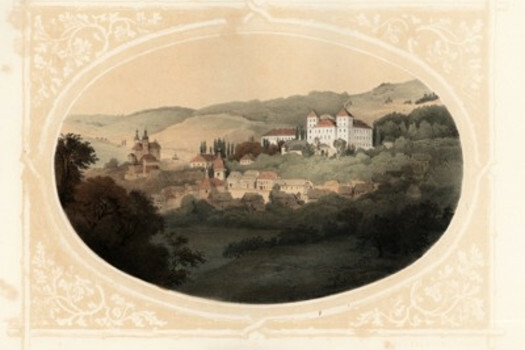 Later on František Maxmilián Kaňka had a hand in the design. 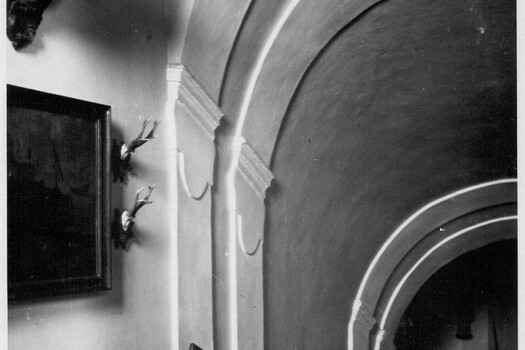 Around 1740 stucco was added to the vaults of the smaller hall under Johann Ferdinand Kager von Globen (1721–47), and ceiling paintings in the 19th century. The Baroque park, founded after 1700, was expanded from 1730–33 in the French and Italian spirit. It features numerous valuable sculptures and statues from the workshops of Matthias Bernhard Braun and his nephew Anton, representing allegories of human attributes, and figures from Greek mythology – the most valuable collection of sculpture by Braun after Kuks in East Bohemia. The originals of the sculptures are currently deposited in Kladruby monastery near Stříbro and they are replaced in the park by copies, seven of which were spirited away in 2003/4. Many other minor works of sculpture have been preserved, such as the statue of František Antonín Sporck (Braun’s patron) by Anton Braun from 1733, the sculptural decoration from the theatron, the fountains with enormous water monsters, obelisk and others. An extensive water reservoir system was established on a hill northwest of the castle, where water was fed through wooden tubes from the surrounding slopes. Water from the reservoir was released into long cascades, which channeled through three large dolphin sculptures. The park is enclosed by trompe l‘oeil gates to the west of the complex. The radial composition of the park is well captured in the first ‘military’ map from 1780–3. 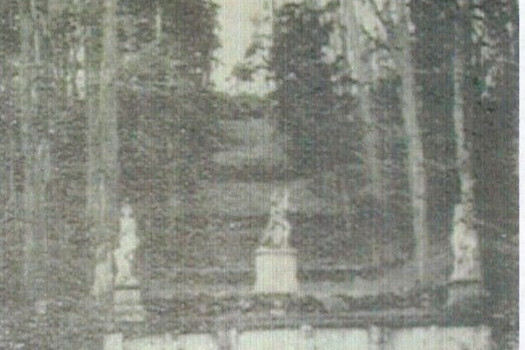 During the transformation of the Baroque garden to an ‘English park‘ at the end of the 18th century and beginning of the 19th century by the Korb von Weidenheim family, there appeared follies such as a theatron (outdoor theatre in Greek style), summer house and obelisk. A forge, coachhouse, farm buildings and a cast-iron steel greenhouse of Baroque origin stand southwest of the castle, to which a round pavilion (a cast-iron construction with a glazed dome finished with decorative finials), brought from Vienna by Vincent Thurn Valssassin in 1892, is attached on one side. It seems an earlier summer pavilion in the northeastern part of the park was rebuilt into an Italianate building with an asymmetrical tower in this period. 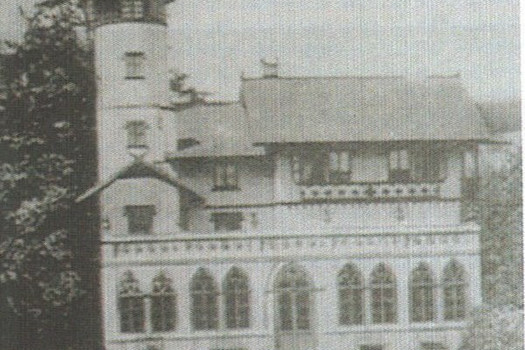 Minor Neo-Baroque alterations to the castle took place under the Thurns in 1895–96, including to the terrace, where Braun’s sculptures were installed. 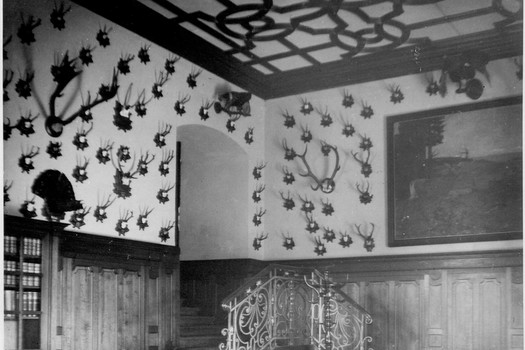 A fire in 1976 left the house a ruin; however since the 1980s the renovation of the interiors continues and the castle is not yet open to the public. 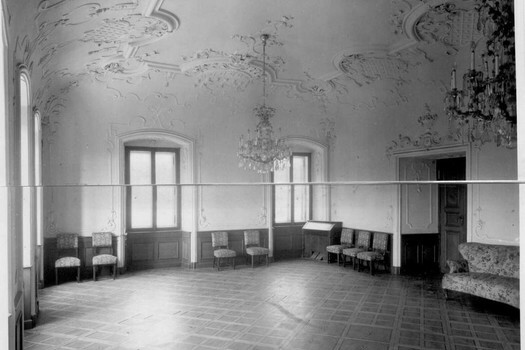 The main room with costly stucco and ceiling paintings survived the fire with minor damage. 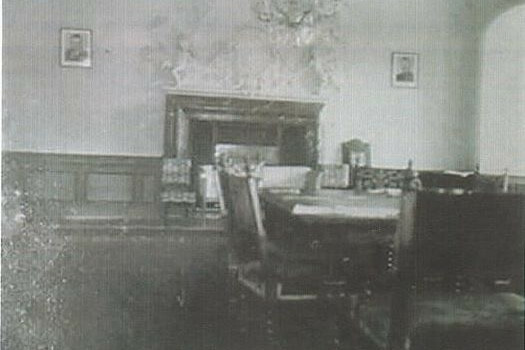 After the completion of the renovation the original furniture that has been preserved, mostly furniture and paintings, will be returned to the castle. The Holy Trinity church from 1718–28 (builder Giovanni Antonio Biana Rossa) built by Jan Kryštof of Štampach, stands to the south of the castle. It is a monumental central construction with a square (oval inside) nave, vaulted with a cupola, and a three-sided presbytery, expanded façade and facing it symmetric twin towers (with a sacristy on the ground floor and oratory on the upper), which lie beside the nave and presbytery. The extension to the presbytery axis is Neo-Classical from 1840. The main space is vaulted by a cupola with a lantern, and the presbytery, sacristy, oratory and organ loft by cap vaults with stucco frames. 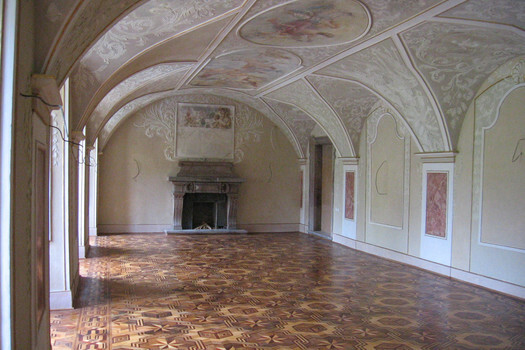 The ceiling paintings with scenes from the Bible are originally Baroque, even though overpainted. 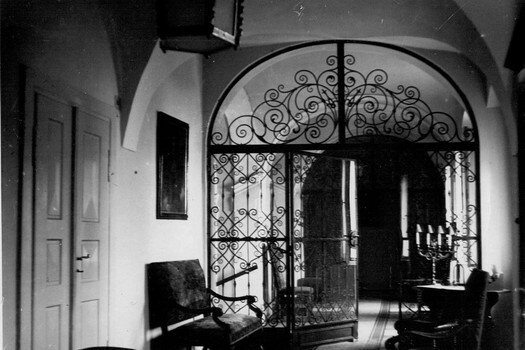 The church gained valuable furnishings in around 1730. The Holy Trinity column of 1727–30, with rich figurative decoration, stands in front of the church, and is encircled by a balustrade with orbs and statues of Czech patron saints from the workshop of Matthias Bernhard Braun. From 2009–11 the church and column went through an elaborate heritage-restoration. Free-flow tours of the house began in 2013.